This projector is easy to connect to with multiple inputs, a built-in speaker and USB Power. Perfect for connecting HDMI dongles such as the Google Chromecast and the Optoma HDCast Pro (sold separately) or a laptop, PC or Blu-ray player for clear projected images with sound. 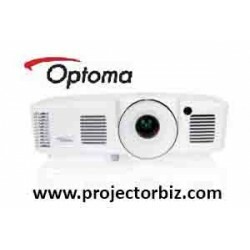 Portable and lightweight projector can be installed or taken on the move for off-site meetings with the optional carry bag (sold separately).